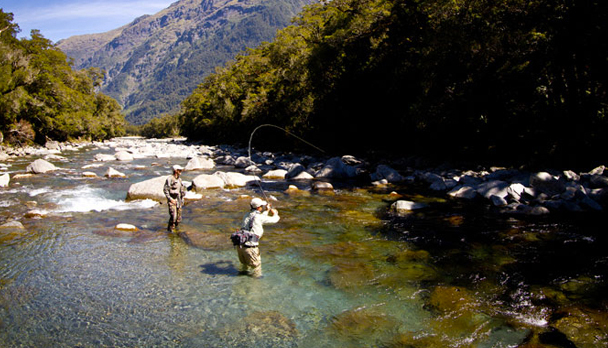 The lodge's 5 acre property lies along side the banks of the Makarora River and is bounded by the majestic Mt. Aspiring National Park. This is prime fly fishing territory; both Rainbow and Brown Trout reside in the pristine waters near the Lodge. In fact, it's not unusual to see both species occupying the same pool or run. Almost all of the fishing requires angler and guide to stalk the fish, locate their target, carefully prepare for the presentation of the fly, and anxiously anticipate the strike. In the heart of New Zealand's South Island, located 1 hour from Wanaka and 2 hours from the adrenalin capital of the world Queenstown, the lodge's 5 acre property lies along side the banks of the Makarora River and is bounded by the majestic Mt. Aspiring National Park. This is prime fly fishing territory. 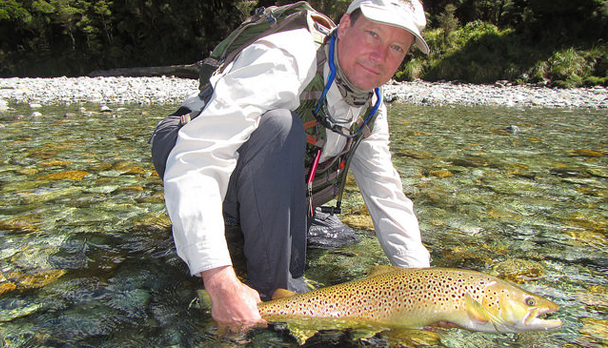 New Zealand trout are wild; both Rainbow and Brown Trout reside in the pristine waters near the Lodge. In fact, it's not unusual to see both species occupying the same pool or run. Almost all of the fishing requires angler and guide to stalk the fish, locate their target, carefully prepare for the presentation of the fly, and anxiously anticipate the strike. The Lodge's fly-in helicopter concession affords anglers total mobility to remote waters where the lack of other fishermen permits unencumbered angling and numerous fishing options. It's the only owner operated heli-fishing lodge on the South Island. Pilots and guides collaborate each morning to find the best water for the day. While New Zealand trout are not easy to catch and can be quite spooky, long casts are not the norm. Most casts are made between 25-45ft. The first cast is always the most important, so the guides will carefully position and coach anglers so that they can make an optimal presentation. Whilst a 10-pound plus trout is a rarity, guests will fish at trout that are consistently in the 3-6lb ranges. And from time to time some are fortunate enough to land the "big one". Your typical day begins with early coffee and an ample breakfast. Beginning around 8:45am the Lodge's helicopter begins shuttling guests from the helipad located just a few feet away from the lodge to spectacular fly-fishing locations. Depending upon river and weather conditions flights may be as short as 10 minutes and as long as 40 minutes. 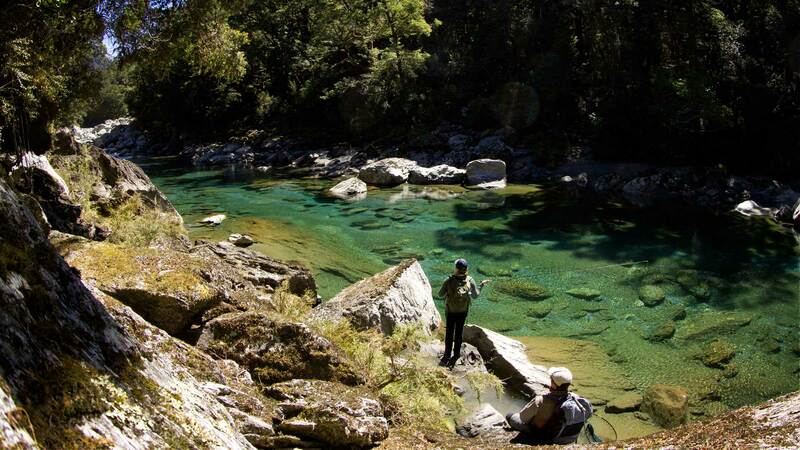 Streamside lunches are served amidst the rising, bush clad mountainsides, spectacular waterfalls, and the lush native Beech forests of the river valleys. 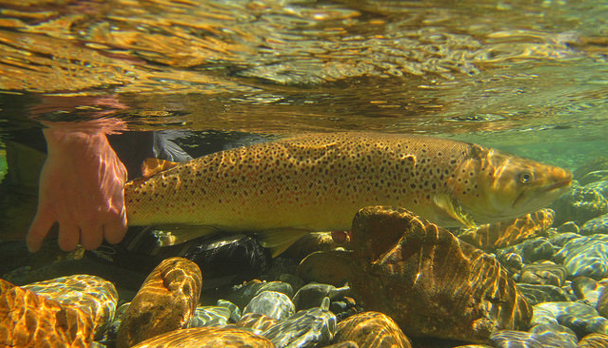 Nowhere else in the world can large, wild, Rainbow and Brown trout be caught on a dry fly in such a pristine environment. At the end of the day the helicopter picks you up streamside, and you are safely returned to the comforts of your home away from home. Soon after guests are greeted with hors d'oeuvres, cocktails, and dinner. Cedar Lodge is comprised of four rooms, lounge and dining area. Rooms are twin single accommodation with all the modern convenience's including in-room Wi-Fi. Each room has a balcony with a beautiful ever-changing rugged South Island view. The food, gourmet delights, is created by some of the finest chef's in all of New Zealand. Meals feature the very best "clean and green" produce New Zealand has to offer. DRY FLIES: Royal Wulff #10-14, Parachute Madam X #8-12, Parachute Adams #10-16, Foam Hopper Patterns #8-12, Cicada Patterns. NYMPHS AND WETS: Bead head Hares Ear #8-16, Possie Bugger #10-14, Copper Johns Red #12-16, Mid to small #8-12 Stonefly Nymphs, Cone head Streamer Patterns. Layering is the mantra, A mid-weight fleece for cooler days, Thin wool or synthetic long underwear, Lightweight quick drying pants and shirts, Lightweight Gore-Tex rain jacket, Insect repellent clothing is very effective, Buff headwear, Sun gloves. Hat, sunscreen and lip protection, Insect repellent, Digital Camera, Polarized sunglasses in Brown and Amber colored lenses, Small day pack or hip pack, Fishing license, Back country fishing license. Rates include: 7-night accommodation and 6 full fishing days. All meals and beverages, open bar and helicopter flights. Rates do not include: Air tickets, transfers, personal insurance, fishing equipment and flies, gratuities for lodging staff and guides. 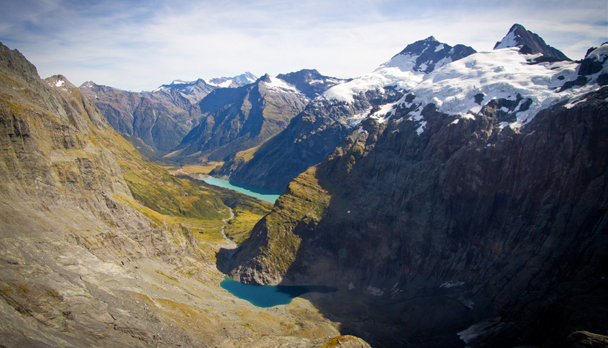 Notes: Ask for Heli-hiking rates and the toruistic package along New Zealand's hottest spots! The month of February was extremely dry on the South Island. Numerous fires have been started, but fortunately everything remained safe at the Lodge. The Makarora Valley has remained green and without fires. Despite little rain and low water there has been some very nice fishing... and a few tougher days thrown into the mix of February.